Be the first to share your favorite memory, photo or story of Alexandria. This memorial page is dedicated for family, friends and future generations to celebrate the life of their loved one. Alexandria Elizabeth Barch was born October 1, 1991 in Commerce Township, Michigan to Paul Arthur and Kim Joelle (nee: Sanders) Barch. She died February 4, 2019 at the age of 27. Alexandria is survived by her parents Paul (Lauren) Barch and Kim (John Miller) Barch. Loving sister of Dominic Barch and her step brother Ian Miller. Grand Daughter of Nancy Klausen-Mash and the late Barry Alan (Anne Criswell) Sanders, the late Howard C. and the late Majel Barch, Donna Miller and Amy (Tim) George. She is also survived by numerous aunts, uncles, cousins, extended family members and friends. 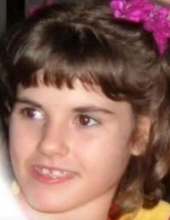 Alexandria was diagnosed with Rett Syndrome (Silent Angels) at the age of 3 and she attended Wing Lake Developmental Center in Bloomfield Township until this past summer. She was known for her bright eyes and contagious smile, along with her infectious laugh. She enjoyed Sesame Street videos and her favorite song by the Count, The Batty Bat. She loved being around her golden retrievers, especially her favorites Candor and Deja and Rufus, the toy poodle at her dad’s house. Music was known to calm her, and her mother’s singing often brought her comfort during her most difficult times. Funeral mass from St. Patrick Catholic Church 9086 Hutchins Rd. (At Union Lake Rd.) Friday 11 AM (In State 10 AM). Interment All Saints Cemetery, Waterford. Friends may visit Lynch & Sons Funeral Home 340 Pontiac Trail Walled Lake (3 Blks. S. of Maple Rd.) Thursday 3-9 PM (Rosary 7 PM). Memorials to the Rett Syndrome Research Trust appreciated. "Email Address" would like to share the life celebration of Alexandria Elizabeth Barch. Click on the "link" to go to share a favorite memory or leave a condolence message for the family.